See more information and photos of tina. I have an ambitious itinerary… Any suggestions or comments are welcomed. Can spend longer on tour if necessary. Climb Little Adams Peak ? Kosgoda Turtle hatchery evening – it this day too ambitious timewise? Are we able to spend less time in Dambulla and visit more than one attraction a day? 2 persons traveling. We want a private driver/guide who is licensed to enter and guide us through the national parks and sites. Do we need a 4wd in Yalal national park? If so, how do I go about achieving this? See more information and photos of Sri Lanka Trekking Tours. See more information and photos of BJ Colombo Tours. Visit plan in Evening : Sri Maha Bhodi , Ruwanwelisaya , Isurumuniya Temple , Mirisawetiya Temple. Considering climate condition of Anuradapura evening is better time to visit above places. Above places are out of Main Ruin City and charging individually for Entrance. Also at evening ( Night ) very scenic with light on. On the Way will visit Ritigala Ruins. Evening at 4.00 p.m will Start the Climb Sigiriya for Sun set of the Day at Top of Lion Rock. Evening Kandy – devil dance evening and Visit Tooth Place. Stop over Ramboda Water Falls. Yala National park Safari – You should be hire a Jeep . ( It could be 2 WD or 2WD , Specialty modified for Wild life Safari ) With assistant with Tour Driver you can hire it. See more information and photos of Mango Vacations. All year round, Sri Lanka never ceases to amaze. With an unique mix of people, landscapes and cultures, Sri Lanka draws more than two million of visitors over each year. Your details are not clear to give a proper answer in some cases. Do you want just a licensed guide? Or a guide with a vehicle+Driving? Do you want rates for your tour? Or you need just suggestions about your itinerary? Certainly you have already been given some ideas! I think the number of nights you are spending in each place is reasonable but you may be trying to achieve too much on some individual days. This is all subjective and depends on how active and busy you want to be during the day. You will quickly decide after a few days whether you are doing too much and can adjust the rest of the plan accordingly. 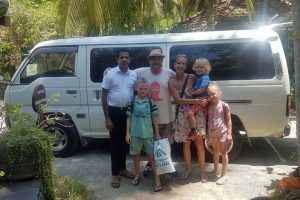 If you require a guide to give you a tour of the sites then you should choose a Licensed Chauffeur Tourist Guide Lecturer. With regards to the safari, people normally arrange a separate jeep at the park entrance with another driver and tracker. Most drivers will have one or two contacts at the park who they use regularly and will be happy to arrange this for you. Of the Beach resorts in Negombo is the earliest patronised beach. It is famed as a fishing town of which 36% of the population are fisher folk. It has a long, wide, stretch of sandy area with many attractions both on land and water. Narrow streets and an old-fashioned mood typify this lively town. Pinnawala Elephant Orphanage – Pinnawala Elephant Orphanage is situated northwest of the town of Kegalle, halfway between Colombo and Kandy. It was established in 1975 by the Sri Lanka wildlife department in a 100,000 square meter coconut property near the Maha Oya river. The orphanage was originally founded in order to afford care and protection to the many orphaned Elephants found in the wild. Then proceed to your hotel in Sigiriya. Sgiriya (or Lion Rock) is the center point of Sri Lanka’s rich culture and history. A spectacular Rock Fortress it is one of Sri Lanka’s major attractions and for certain the most famous. It was once discussed as being the 8th Wonder of the World with its science baffling Water Gardens, the Frescoes of beautiful maidens, the Mirror Wall with ancient graffiti, the Lion platform and the Summit of 1.6 hectares, which was completely covered by buildings during the period of Sigiriya’s glory. Built by King Kashyapa (477-495 A.D), the “Lion Rock” is a citadel of unusual beauty rising 200m from the scrub jungle Dambulla – Located in the north central province is another UNESCO World Heritage site which dates back to the 01st century BC. An amazing complex of 05 caves, first used as a refuge by an overthrown King who on regaining his throne, commissioned magnificent carved images on rock. The caves now contain over 150 images of the Buddha of which the largest is a colossal figure spanning 15 meters. Cave inscriptions and paintings from 2nd Century BC provide for the perfect location to view the evolution of ancient Sri Lankan culture and art through an amalgamation of the material from many eras. Kandy – A World Heritage city and the second largest Sri Lanka set on a plateau surrounded by mountains, A World Heritage city and the second largest Sri Lanka set on a plateau surrounded by mountains, which are home to tea plantations and bio diverse rainforest. Traditions and culture remain undisturbed by European influence in the colonial era. The Royal Palace, now known as the “The Temple of the Tooth Relic” (of Lord Buddha), situated right beside the city’s beautiful centerpiece lake. Some days the skies seem perpetually bruised, with stubborn mist clinging to the hills surrounding. Delicate hill-country breezes impel the mist to gently part, revealing Kandy’s improbable forested halo. Kandy is also home to one of the largest botanical gardens in South East Asia. The Gardens dates back to the 14th century and boasts over 4000 species of plants and many trees with significant histories. Visitors from the UK will be particularly interested in the Cannonball Tree planted by King George V. The tree is bent with its fruits, which resemble cannonballs hence the name. Bentota is a popular stretch of beach resorts offering excellent sun sea and sand to enjoy your dream vacation. Bentota has plenty to offer apart from pure leisure. It is a recognized area for scuba divining, snorkeling and many water-based sports. En-route visit to Galle, Built by the Dutch, beginning in 1663, the 36-hectare Fort occupies most of a promontory that’s surrounded on three sides by the ocean. Just wandering the old walls and streets at random yields one architectural surprise after another as you explore the amazing collection of structures dating back through the centuries. Its glories have earned the Fort status as a Unesco World Heritage Site.